Wow! It is Sunday, Sept. 27, 2009. Today is our first cloud-free day, and because it’s Sunday – bbq on the deck! 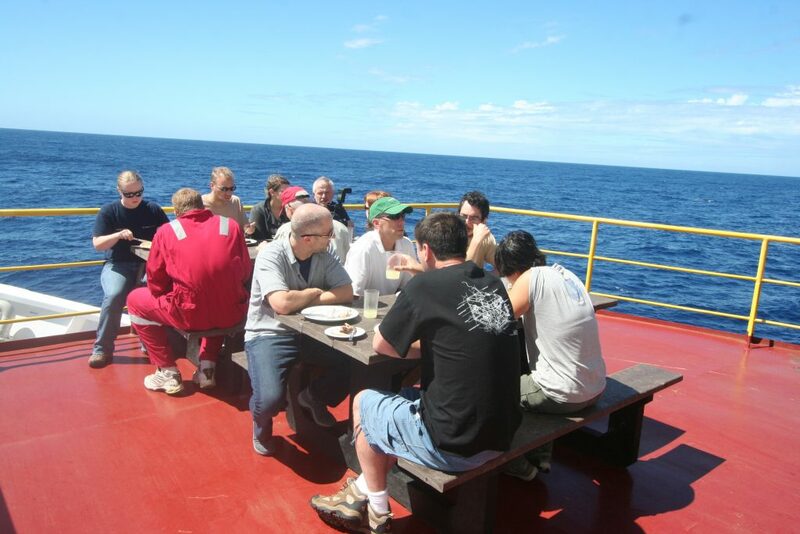 We had lunch on the deck, and more spectacularly, supper on the deck. Today there is another reason to celebrate. Friday evening we started the process of changing the drill bit. We have been drilling for several days with one drill bit and it has come to the end of its life, and if we are to continue drilling we need to change the bit. This is a long arduous process where we drop a funnel that surrounds the drill ‘string’. I’ve come to appreciate the name ‘string’ given to a steel pipe sticking down from the ship to around 3.5 km to the bottom of the ocean; it’s a matter of perspective, to put together as long a pipe as this that is swinging and swaying in the ocean currents and hitting the bottom, makes this pipe look like a piece of string. Anyway, to make a long story short, our JR crew was successful in dropping the funnel in the hole, pulling up the drill string, changing the bit and dropping the string back into the hole and we are drilling – very impressive! But back to tonight, while we were having our lovely dinner out on the deck, at around 1824 hour, the International Space Station passed almost directly above us in the night sky from east to west, from the starboard side to the port side of the ship. Wow, the ISS gave us a ‘Science Salute’ from one pioneering international program to another. The IODP is an international program with scientists from Japan, China, Korea, US, and Europe, all working together with the common goal of science; politicians can learn something from us. Later tonight (actually the 0200 our time, Monday) I will be talking to our class in the the Virgin Islands about the science happening onboard, with much appreciated help from the scientists aboard who have shown great enthusiasm in the education program that is part of IODP. As the ISS gave us a salute as it sailed across us in the night sky, I thought I would give a salute back. Of course, I speak for myself, but seeing the excitement and enthusiasm around me, I think, we all, onboard the JR salute the ISS.